Open your heart and bring in love and joy as Mission Neighborhood Health Center celebrates 50 Years of Healthcare with a Heart! 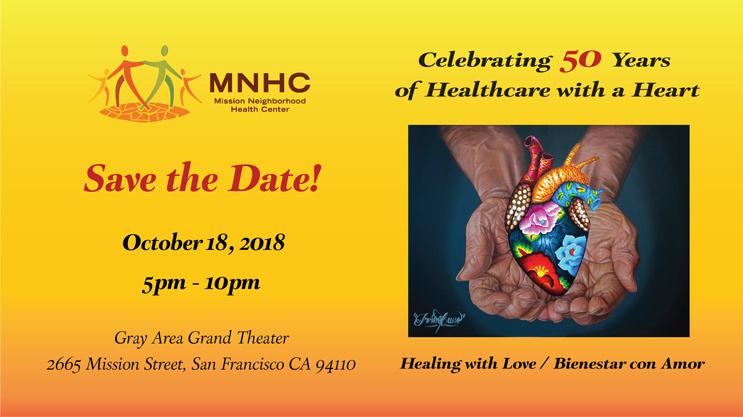 We invite you to join us at the MNHC benefit, Healing with Love / Bienestar con Amor that will take place on Thursday, October 18th 2018 from 5:00pm-10:00pm at the Gray Area Grand Theater in San Francisco’s Mission District. Enjoy an inspiring evening of networking, savory Latin American tapas, libations, performances, and live dancing music that will warm your heart. Julio Bravo y su Orquesta Salsabor has been bringing hard hitting salsa to Bay Area salseros for nearly 20 years. Hailing from Peru, lead singer and band leader Julio Bravo brings together a talented group of musicians to create his own unique blend of energetic danceable salsa that has made them one of the Bay Area’s top salsa bands. Chavalos promotes the culture, art, music and traditions of Nicaragua. They do this by producing cultural events from poetry nights, cultural nights and concerts. They bring artists from dancers to musicians from Nicaragua to perform for the community in the Bay Area. The funds raised at their events are used to help children in Nicaragua. They take clothes, school supplies, toys and food to kids in poverty. And that is where their name comes from, Kids from here helping Kids from there. Chavalos de Aqui y Alla. And the dance group reflects that as well, Dance for Nicaragua, Chavalos Danzas por Nicaragua. 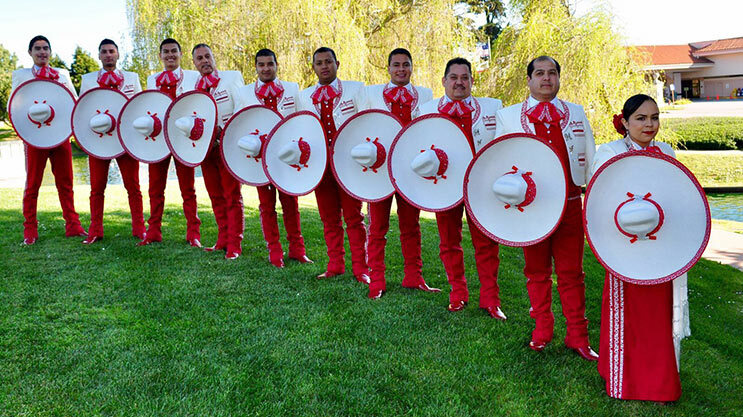 As the premier San Francisco Mariachi band, Mariachi Nueva Generacion consists of studied, professional musicians combining over 35 years of history and music experience to bring the essence of traditional Mariachi direct to your heart. In 2002 Salvador “Chava” Garcia formed and directed the group along with Higinio Espinoza. As the elder, more experienced members, they brought a storied history and experience from bands in both Mexico and California. They have performed in many states around the US and Mexico. In addition, the group also has several extremely talented younger members bringing classical training and youthful experience to the fold. 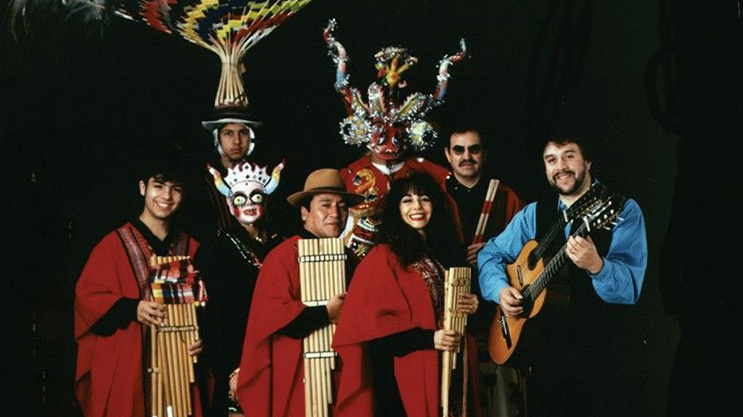 Sukay, an international touring musical group, is known in the United States, more than any other group, for bringing the music of the Andes for the first time to thousands of cities and concert stages throughout North America. The group’s name came from the ancient language and culture of the Quechua of the central Andes, and it means “to open the earth and make it ready for planting”. Sukay was formed by Edmond Badoux from Switzerland and Quentin Howard in Montreal, Quebec in 1975. They traveled to South America for 15 months where they studied Andean music in many small villages in Ecuador, Peru and Bolivia. Eddy & Quentin Navia founded the Peña Pachamama in San Francisco, CA, which for the past 20 years has become the gathering place for the great world music and dance. Mission Neighborhood Health Center (MNHC) delivers primary health care services across the life-cycle including prenatal care, pediatrics, teen services, family planning, women’s health services and adult and senior medicine. MNHC also provides specialized HIV services at its Clinica Esperanza and a program of support and health services to the homeless through our Mission Neighborhood Resource Center. Mission Neighborhood Health Center was founded as a health center in 1967 to respond to the healthcare needs of low income families in the Mission neighborhood community in San Francisco. From the humble beginnings of delivering care in a trailer in a parking lot at our Shotwell Street site for $1 per visit, we have grown to become an intergral part of the community. Each year, MNHC serves nearly 13,000 patients at its four sites in the Mission and Excelsior neighborhoods in San Francisco. Partner with MNHC and join us in “Healing with Love /Bienestar con Amor.” Become a sponsor, purchase your ticket, or make a donation today!